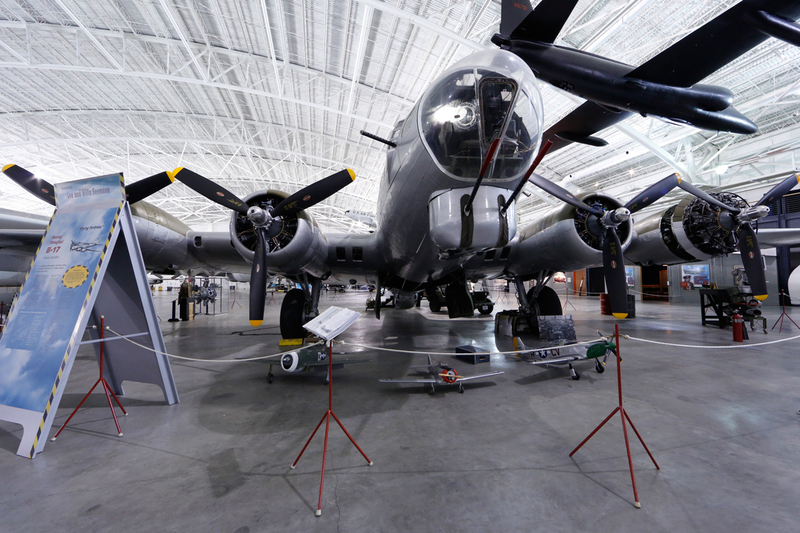 Number Built : A total of 12,731 Flying Fortresses were produced in the period 1935-1945. Of this total, Boeing built 6,981, Douglas Aircraft built 3,000 and Vega (Lockheed) built 2,750. Break Down by Model: 1 Boeing model 299, 13 Y1B-17s, 1 Y1B-17A, 39 B-17Bs, 38 B-17Cs, 42 B-17Ds, 512 B-17Es, 3,405 B-17Fs (2,300 Boeing, 605 Douglas and 500 Vega), and 6,430 B-17Gs (4,035 Boeing, 2395 Douglas and 2250 Vega). Contracts for 730 B-17Gs expired at the end of the war (600 Douglas and 130 Vega). Approximately 4,750 B-17s were lost on combat missions. Powerplant: Wright R-1820-97 Cyclone, 9-cylinder radial, air-cooled engines, 1,200 horsepower each. Weight: 36,135 lbs. empty, 55,000 lbs. loaded, Maximum takeoff weight 72,100 lbs. Dimensions: Wingspan 103’9″, Length 74’4″, Height 19’1″. Performance: Maximum speed 287 MPH at 25,000 feet, Cruising speed 182 MPH, Range 3,400 miles. On September 26, 1934 the United States Army Corps allocated $275,000 to Boeing to design and produce a four-engine bomber. Within eight months the Boeing Project 299 produced the first B-17 Flying Fortress. The inaugural flight took place on July 25, 1935. Exactly one month later the B-17 flew from California to Wright Field in Ohio, covering a distance of over 2,000 miles in nine hours (averaging 233 MPH). The Army Air Corps officers called the plane “Boeing’s Aerial Battlecruiser.” Later, it was officially designated the XB-17. The B-17 Flying Fortress effectively operated in all theaters of operation during World War II. In addition to the American Air Corps, the Royal Air Force used a number of XB-17s during WWII. The German Luftwaffe even used captured XB-17s to drop spies into Britain. After World War II, the Army Air Corps distributed several B-17s to nations including Isreal, Sweden, and a number of countries in South America. Later, the United States Air Force utilized retired B-17s as targets for remote controlled drone target planes. The Air Force relegated S/N 44-83559 to the Strategic Air & Space Museum at Offutt AFB, Nebraska. 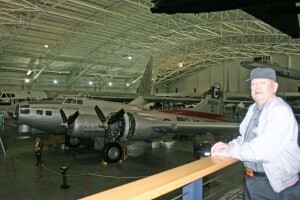 The Fortress was flown to the Museum in May 1959, and has been on continuous display ever since.